This book was published in 1932 and all I could think as I was reading it was Seriously? This dude came up with this 85 years ago? How did he know?! I didn't enjoy the book. It was depressing and bleak. But I was intrigued ... 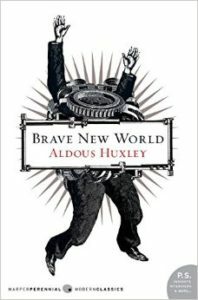 I wanted to know what other crazynotsocrazy stuff Huxley would come up with. Okay actually the part on the reservation with the savages got super weird. I couldn't get past the horrendous description of Linda. It really kind of grossed me out. Actually, though, I bet she wasn't as disgusting as she sounded. She probably looked like your average person today. She was just surrounded by perfect barbie doll clones, so compared to them, she was a monster. Thank goodness this book is short. By the time I reached the hopeless ending, I was more than ready to be done with it. I'm surprised that there's not been a movie made. This depressing weirdness seems like something Hollywood would jump all over. I mean, c'mon Oprah, it's right up your alley.